I found this idea online and couldn't stop thinking about them. I knew they would be perfect for our annual Super Bowl party. Take strawberries out after 24 hours and pat dry. Then dip in chocolate, refrigerate for 15-20 minutes to harden. These are DELICIOUS! Everyone will love these!!! OH My chocolate goodness. Easy. and DIVINE! perfect for dinner with guest on V-day! I've also seen marshmallow vodka but I think the whole chocolate on chocolate would be good. I have a friend that wants me to bring over a dessert to go with chocolate wine and I think this is it! We're huge fans of this recipe too, especially with the milk chocolate! What a fab idea! We have some Chocolate Vodka at home, just might have to make some for Valentines Day!! New follower from Thrifty Thursday. So happy to find your awesome blog! Yum, yum! As soon as I have this baby, I'm making these. These sound very good. I will try these very soon. I've done vodka soaked cherries but strawberries, amazing! These look awesome and got my attention! Thanks for linking them up to Fat Camp Friday last week, they will be featured on Wednesday! Check out my blog and follow back if you like! this is unique and it is very easy to do! Would this work with rum? I have mango flavoured rum - and cherry flavoured rum. Looking for interesting ways to use them for a party next weekend. I made these last night. Holy Moly! Way too strong for me! I not a drinker, so that may have something to do with it, but I couldn't even taste the strawberry. At all. Definitely not for me. 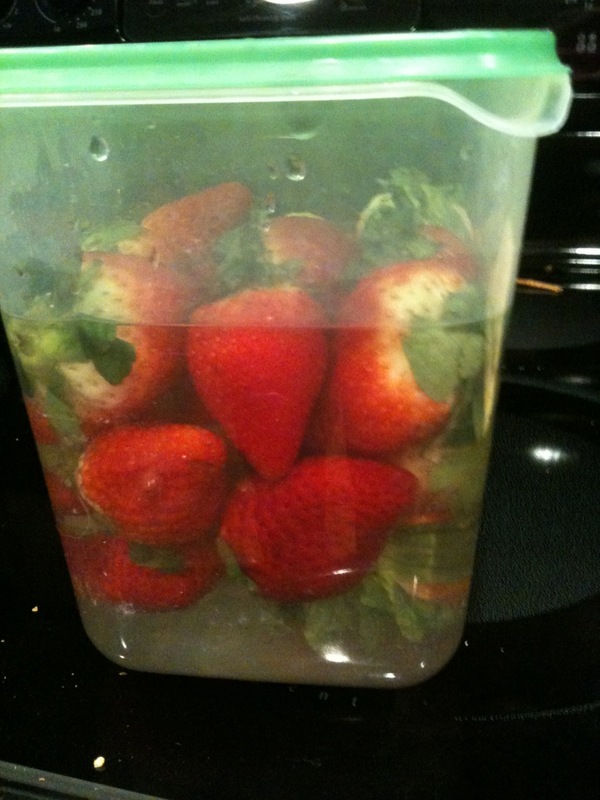 Maybe soaking them in strawberry vodka would leave more flavor? I don't know. I won't waste any more money on the alcohol, though. Sorry. I'm so sorry to hear that! Yes, if you are not a drinker then you probably will think they are too strong. I do not consider myself someone that likes super strong drinks either. My friends and I enjoy the fruity type "girly" drinks. I would never be able to drink straight vodka (flavored or not) and we don't find these to be too strong. I will say the 24 hour mark is KEY! I have marinaded shorter and longer and both leave it too strong. 24 hours is a must! I have thought about trying whipped cream vodka with a side of whipped cream to dip! We did it with the Whipped Cream vodka and it was devine!! Was wondering if you could re-use the now infused strawberry chocolate vodka to make a chocolate covered strawberry jello shot? I imagine the chocolate taste of the vodka would get overran by the actual chocolate coating. Which would just leave behind the flavorless burn of the vodka... Is that desirable? A lot of the flavored type of vodkas don't seem as overpowering as actual plain vodka. It is just fun to put an adult twist on an enjoyable dessert. Everyone at the parties tend to think it is so different and clever that they can't stop eating them. I have done an alcohol infused batch and then just your regular choc covered berries so people have the choice. Why hadn't I thought of this, purely genius idea. Thank you very much for sharing, I see this is our 4th of July lineup. Try soaking them in the chocolate vodka for 24 hours, cutting the tops off, and hollow out with a paring knife, add philidelphia cheesecake in the top, dip in chocolate, and then drizzle chocolate over them!! GREAT for a birthday party! Thanks so much for the idea! This sounds amazing! Glad you enjoyed them! Could not find choc vodka so used plain vodka. Anyone just tried plain vodka? Waiting for the 24 hrs to pass. I have not tried plain vodka. I hope they turned out ok for you. I typically find the chocolate vodka next to all the other flavored vodkas out there. hmmm...interested to know how many strawberries are used for this recipe and the amount of vodka used to soak the berries. One comment said they tasted too strong!!! I would like to try this with the right amounts...thanks! I just made TWO batches. One soaked in chocolate whipped vodka (Pinnacle brand)... the other in SUGAR COOKIE vodka (Burnett's). BOTH are absolutely delicious. For waaayyy less mess & time you can always use magic shell instead of melting chocolate. It does crack when you bite into them, so it's better if you use smaller, more bite sized strawberries with the magic shell. It's a huge help when they're for a large, drunken crowd. Did any one else have an issue with the berries turning mushy (they looked like thawed frozen strawberries)? I soaked them for only 20 hours, I was afraid of having mush after 24. This idea is just genius. I found this picture on pinterest, this idea has to come true next weekend, wonderful, wonderful, wonderful! While they are soaking, do you need to refrigerate them or leave them on the counter to keep room temperature? 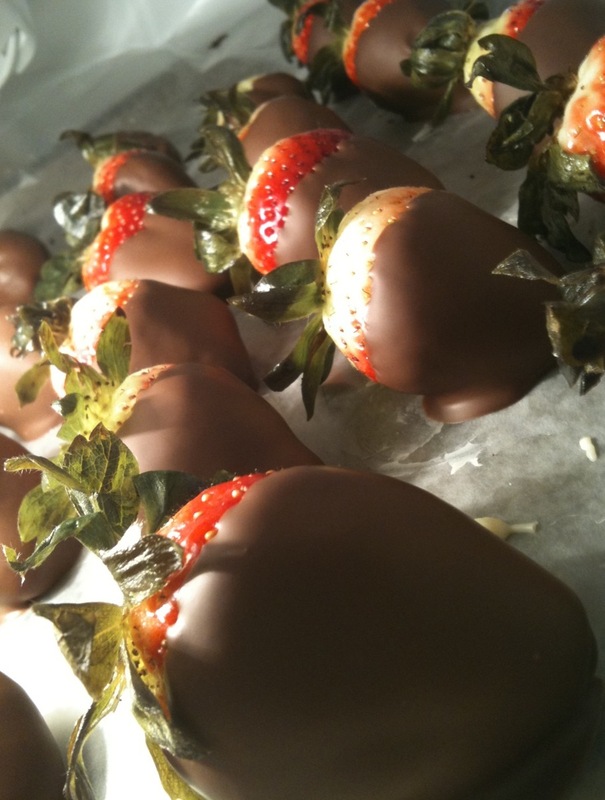 I have just put a large batch of vodka strawberries in the fridge and I am so so SO excited for this on New Years Eve!! We made quite a lot of these last night and did not eat them all, are these ok to freeze? I also agree that they are a bit strong. LOVED them though!! I have never froze them before so I'm really not sure. If you try it, please come back and let me know how they turned out. :) I'm so glad you enjoyed them! Made these a few days ago for NYE and they were a HIT! Can't wait to explore your blog a bit more! After reading the comments I am slightly afraid of mushy strawberries, so hopefully everything works out well! I am also wondering about the mush factor...if you marinate for 24 hours then take them out and fridge em overnight for a party...do they get mushy? I usually find it by the chocolate chips. It can also be called Chocolate Bark. It looks like big bars of chocolate. I have also found it by the cake mixes and frosting before. You can also use melted chocolate chips but I find the bars are much easier. Wonder if I could soak cherries in the choc whipped vodka and it would taste kinda like choc covered cherries ?? I wanted to do this for christmas gifts I use to do moonshine cherries but I thought this would be different but will it be good ?? What brand of Vodka did you use ? I'm in Toronto and the only one I can find is "360 Double Chocolate Vodka"
It is exceptionally costly remaining at $1,350,000 for a jug from the US commonly recognized name with each compartment containing jewel fine art together with yellow and white gold.